Blade length : 23.1 cm or 9.09 inches. Width at the hamachi : 2.26 cm or 0.88 inches. Shape : Regular width and thickness, Mitsumume Tanto. Jigane : Ayasugi Hada well grained with Jinie attach. Hamon : Nie Deki, Suguha Hamon with Nezumi Ashi. Boshi is rounded Yakizume style. of Masamune was the founder of Naoe-Shizu school. Kaneuji worked at Shizu in Mino province. He and his followers moved to Naoe in the Nambokucho period. and Kanenobu but their signed pieces are extremely rare. This sword is very healthy nice sword and also fantastic well grained Ko iteme hada. Menuki : Shakudo, corn is engraved with gold color. Fuchikashira: Shakudo, peony and arabesque is engraved with gold color. 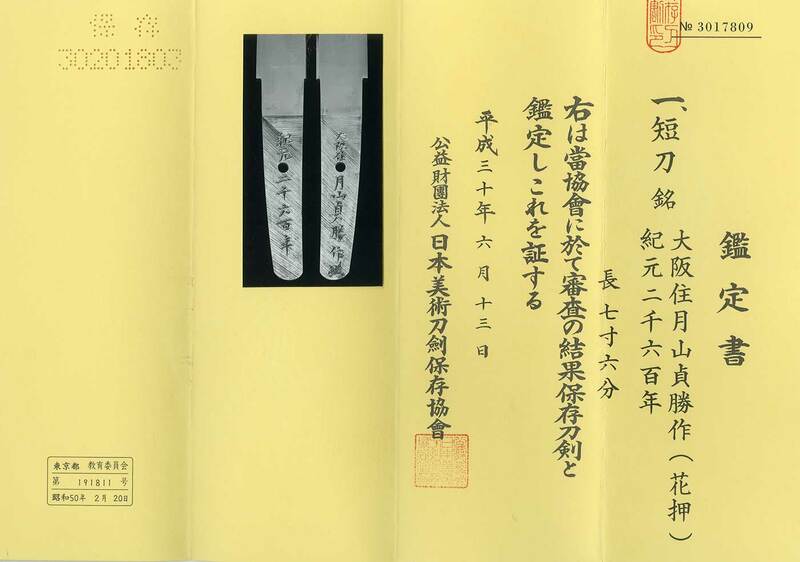 From Aoi Art: Gassan Sadakatsu is a famous swordsmith during Taisho to Showa period. Ayasugi Hada is original of Gassan school. This special Jigane was never allowed to be taken out of that school. This is a masterpiece of Ayasugi Tanto.